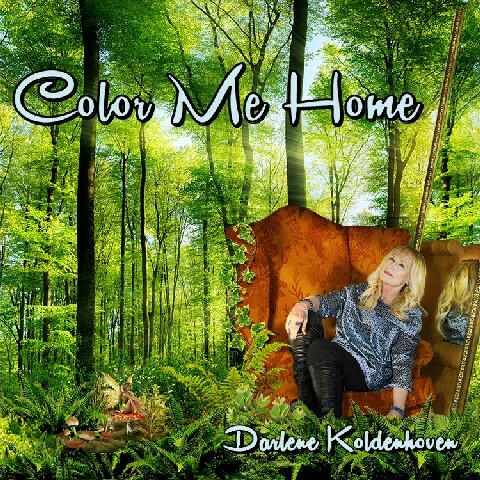 The list of credits for Darlene Koldenhoven on her upcoming release Color Me Home is mind boggling. She is credited with Producer, vocalist, pianist, composer, lyricist, vocal and instrumental arranger, keyboardist and solos, programmer and engineer, Native drums & shaker, album notes and a coloring book. Yes, that is not a typo, a coloring book. A very interesting and fact filled booklet comes with the CD and many pictures that can be colored in. This package is quite unique. I have seen a lot things over my 19 years of reviewing music but this is something special and a pleasant surprise. The pictures in the book are very intricate and personally I would not attempt to color them in fear of ruining their beauty. I am sure there are people out there that will feel entirely different. I understand there are adult coloring books now selling like hotcakes now because people use it as an exercise in relaxation. So, you take that and add the music of Ms. Koldenhoven and you have a potent combination of serenity and spirituality all in one package. The artist grew up encouraged in an environment to color while listening to music. So, everyone that purchases this CD has an opportunity to color Darlene home, hence the inviting title. I must say that I thought there was not much uniqueness left in the music industry but this recording and packaging puts that thought to rest. Along with all the talents that Darlene brings to the table she had 16 guest artists along for the journey. I will not go through the roll call in case I forget someone so I will leave it to you readers to do your research if you feel compelled to do so. Let’s just say the people involved are prominent musicians in the new age community. Darlene’s voice is that of an angel and it is operatic at some points. Her range is phenomenal. And the music? It is incredibly beautiful … filled with textures, colors and all sorts of atmospheres that make your mind wander into dreamland. The combination of vocals and instrumentation is superbly placed within each track. It takes true artistry and natural talent to create such a diversified recording and so many worldly new age flavors. I particularly appreciated the native drums and sounds that made me feel one with humanity and mother earth. It always has that effect on me and it feels warm and real. Who wouldn’t want to listen to music that makes you feel that way? I can say with certainty so early in the year, that Color Me Home should be up for a Grammy. With all things considered and the work and craft that went into this music, I certainly think it deserves all the consideration for awards of recognition. You be the judge and let me know what you think after you stream the player and watch the video provided for your preview.